These cookies couldn’t be any easier to make, unless you had someone else make them for you. If you don’t need them to be wheat free you can substitute oat flour with regular flour. You can also sub the sugars for and dry sweetener of your choice (Florida crystals, sucanat etc). Oh and by the way, they are yummylicious! In a small mixing bowl, whisk together flax meal and soymilk. Add sugar and stir, add oil and vanilla and whisk vigorously until all ingredients are emulsified (about a minute). Mix wet ingredients into dry, fold in chocolate chips. Drop batter by the tablespoon onto ungreased baking sheet, leaving and 1 1/2 inches of space inbetween cookies. Bake for 10 -12 minutes. Remove from oven and let cool for a bit (5 minutes). Using a spatula, put them on a cooling rack or plate to cool the rest of the way. I seem to be doing something wrong with this recipe! I tried it the other night and ground my own flour with oats and all of my cookies flattened out and ran together creating one huge thin cookie! Tonight I remade them using regular flour and the cookies never flattened at all and are very dry! Any ideas? Funny, I made these just last week. Below is my post from the Forum. Let me know if any questions and if they still don’t come out good for you. I made the Wheat Free Chocolate Chip cookies this morning. They were delicious! I made a few changes – instead of 1/3 cup of oil, I used 2 tablespoons of oil and close to 1/2 cup of apple sauce (minus the bite I stole from the 1/2 cup portion). And I only used 1/4 cup of the granulated sugar rather than the full 1/2 cup. Plenty sweet and super delicious! I also did what the side note said to do if you don’t have oat flour – ground up (quick) oats in my spice grinder. Worked very well. 2 c oat flour, 1 1/2 c brown sugar, 1/2 c regular sugar, 1 c coconut oil, 1 quarter of butter, 4 eggs, 1 tsp vanilla, 1 tsp baking soda, 1/2 tsp baking powder, 1 tsp cinnamon, 1/2 tsp all spice, 1/2 tsp salt, 4 c rolled oats, 1/2 c cranberries in half. I started by mixing everything but the ground oat flour with a mixer, mixed in the flour and then mixed in the rolled oats with a spoon. tried 375 for 10 minutes, but cookies ran so dropped to 350 and made smaller cookies and they turned out great. fall apart kind of easy, but delicious. Next time, I think they need to be slightly dryer and they will hold together better. Just made em! Great lookin batch to take to a yoga club potluck. My oat flour wasn’t extra fine, but they taste heartily decadent. A couple of them make a perfect accompaniment for cozying up with some Classic literature (or less romantically, in my case, making a powerpoint presentation) and listening to rain against my window pane. I made these cookies today and they are spectacular!! I am the only vegetarian in my house, but everybody loved them. If you use melted margarine the cookies will flatten. Just soften the margarine to room temperature . It makes all the difference. this is a terrible recipe. they taste so bland & fall apart. find a better vegan cookie recipe, don’t use this one!! I just fed my uni-cookie to the possum that lives outside my kitchen door. Don’t use wheat flour. We ran out of oats, so I tried that and they were pretty rough. After I got less lazy and biked to go get oats, they were scrumptious. Best vegan cookie recipe yet! Christmas Reflections (and a GIVEAWAY) « "The Flying ONION." SO I used this recipe and added another 1/4 oat flour + used egg replacer + 2 tbsp of rolled oats+ hand full of shredded coconut. After mixing I put in the fridge to chill the mixture. I just made these but used only 1/4 cup brown sugar and 70% dark chocolate chips and they were spectacular, still sweet and had an ideal shape and texture! Plus they tasted delicious! Even my non-vegan family loved them! Thanks Isa! 1) After you whisk together the flax meal and soymilk, let the mixture sit for about 10 minutes or so until it becomes “goopy” (yes, that is a scientific term!). This is what’s known as your flax egg, the boon of vegan bakers everywhere! This is what will serve to bind your batter together, much as a hen egg does in non-vegan baking. 2) After you mix everything together (i.e., mixing the wet ingredients into the dry and folding in the chocolate chips), allow this mixture to sit for about 10 minutes so that the oat flour can absorb some of the moisture. This will make your batter more “dough-like” and will prevent the mega-spread that comes about if you try to dump the uber-wet initial mixture onto a baking sheet. blend a handful of crackers first, mine have always turned out great. These are the best gluten free chocolate chip cookies I’ve ever made. I used a flour blend instead of oat flour, and coconut sugar instead of regular sugar, but other than that I pretty much followed the recipe and they were perfect. What can I use instead of flax seed. I have IBS and it irritates my tummy. Anyone tried using shortening in place of the oil/ melted margarine? i was hesitant to try these..no starch, no gum, no almond meal, just oat flour – really? I do a lot of gf/v baking and these cookies are perfect. I used grapeseed oil and cut the sugar to 1/2 cup (used coconut sugar). Keep an eye on ’em while they’re in the oven..they do brown quickly. Ignore all the questionable reviews…follow the instructions, make sure your oven is preheated, measure your flour AFTER grinding the oats, grind them finely! in a coffee/spice grinder! not a blender! and don’t skimp. These are the best gf chocolate chip cookies I’ve ever made. These are great! They only spread out like pancakes if you make your own oat flour and don’t grind them fine enough! And like some other people said: let the flax and milk sit for a while until it thickens and also let the finished batter rest for a few mins before scooping! OR….. Just add enough oat flour until a soft pliable dough forms! I made these yesterday from her book Veganomicon, I wanted something sweet and since I am just learning vegan baking I was looking for something easy and quick these cookies fit the bill. I Loved them my friends Loved them they were a hit.. I have been making these cookies for years. 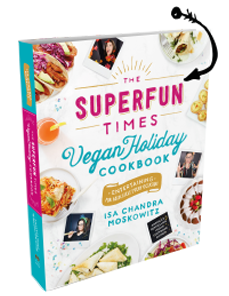 It’s my most used recipe in the Veganomicon book. The reason they spread out into a mono-cookie is because of the amount of white sugar you are using. If you divide the sugar evenly between brown and white sugar, (or use less white sugar than brown sugar) the cookie will keep its shape. Also, I always blend rolled oats for a minute and I use 2 cups of oats, which after blending seem to make 1 3/4 cups oat flour. I double the recipe and add a packet of choc chips (or you can make your own if you blend equal amounts of cacao powder, coconut oil, coconut flakes & dates, then freeze for half hour and break up into pieces). Can this be used to make a pan cookie? My gluten intolerant daughter would like one for her birthday. I was going to double the recipe and spread it onto a round sheet pan.